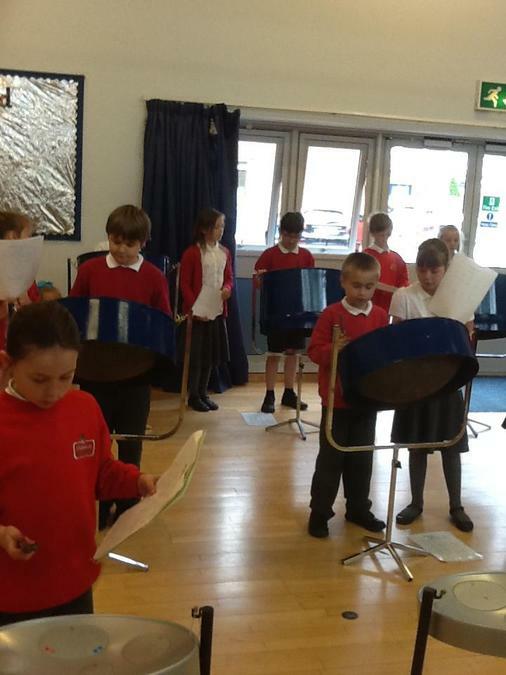 Today, Friday, Year 5 have been experiencing what it is like to be a Year 6. 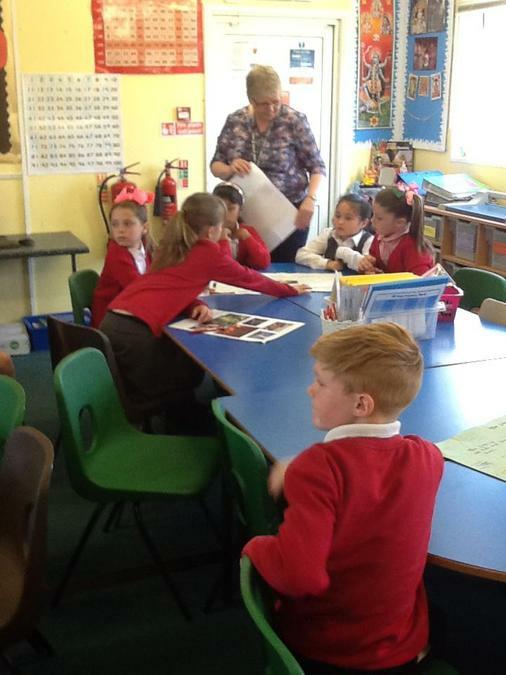 Mrs Pettifor invited us down to her class for the morning. We started by listening to a story told from the point of view of the wolf in Red Riding Hood. The book is called The Wolf's Story. Was the wolf really a good wolf, was he misunderstood? This week in English we have been listening to a disaster story and rewriting it in our own words. We also acted out the story. 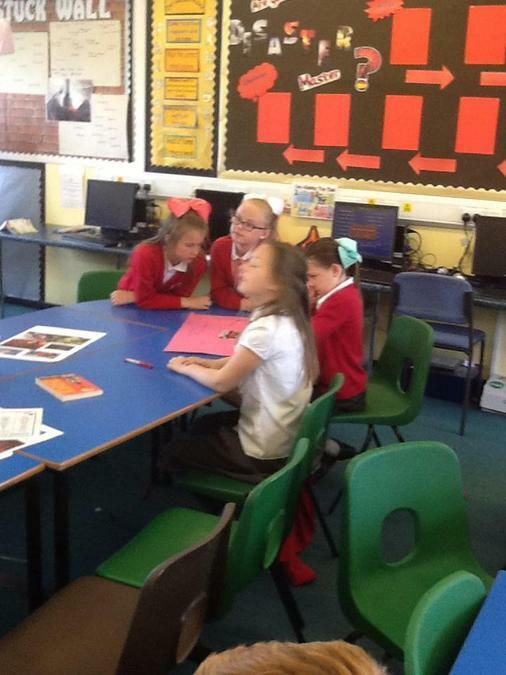 Here are some photos of us working in groups to come up with some interesting descriptions. 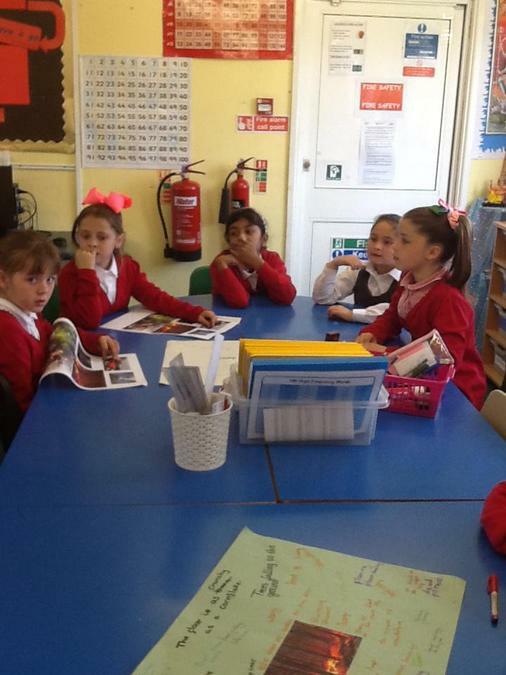 In RE this week we learnt about Hinduism and the life cycle and reincarnation. If you have led a good life you have good karma and are reborn as a baby and the life cycle continues. However, if you have bad karma and have not led a good life you are reincarnated as an animal,insect or plant. 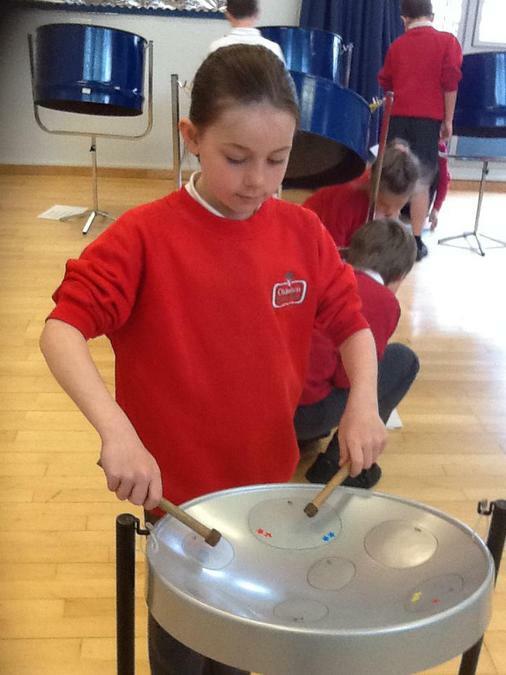 Here are some photos from last Friday's Steel Pan Drum session. 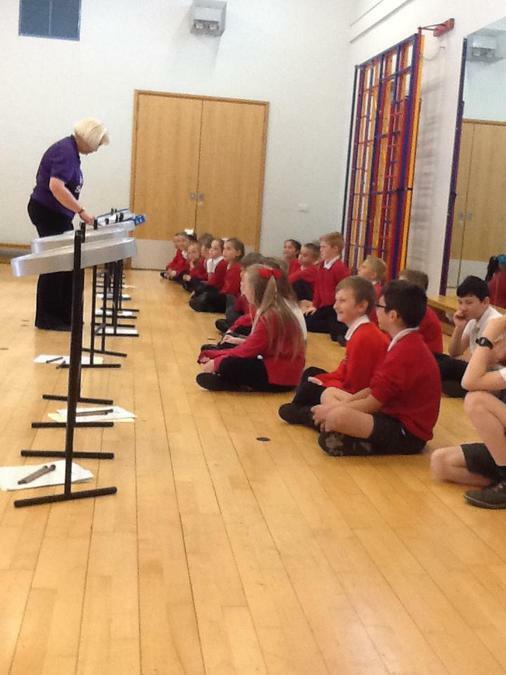 Miss Clough was very pleased with how well we performed on the drums. 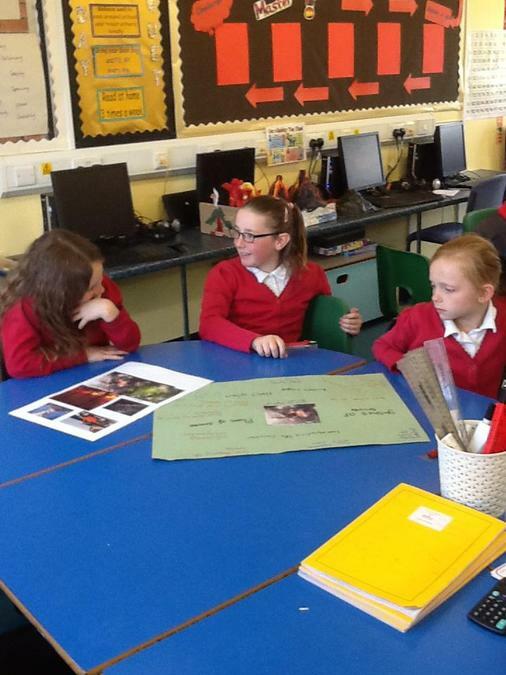 This week we have been writing descriptive paragraphs about volcanoes and on Friday we presented our work to each other. In Maths we have been working on short and long multiplication. By the end of the week some of us were able to multiply by three digits. In PE, the cricket season has arrived at Oldmixon, so we have been playing French cricket. Freddie explained that a group of players go in a circle with one person in the middle. That person has a cricket bat and can only face one way. Another person throws the ball and the person with the bat has to try and hit the ball. They are out if the ball hits them! In RE we looked at Hinduism and the effect of Karma. In Jigsaw the class looked at friendships and how to repair relationships when you fall out with your friends. Welcome back after the Easter break! 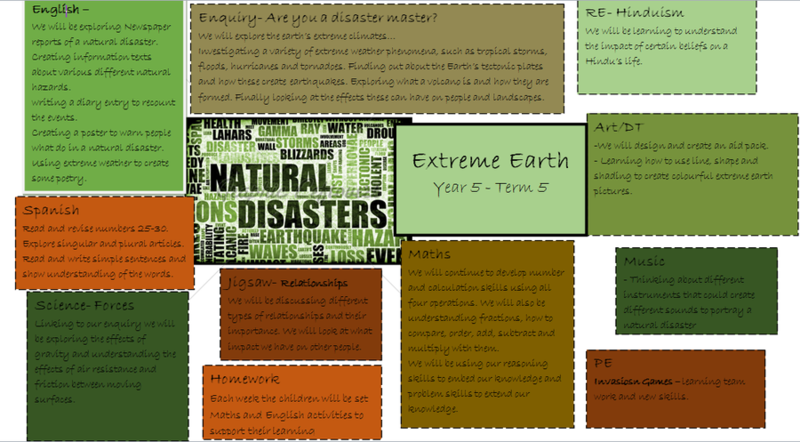 Our new focus for this term is Extreme Earth - Natural Disasters. This week we started by looking at volcanoes and writing descriptive paragraphs. On Friday we wrote a shape poem using our volcano descriptions. In art we created a picture of a volcano using different techniques and texture. The poems and pictures will be on display in the hall next week. In Maths we have continued to work on our calculation skills. We practised drawing and interpreting different types of graphs. 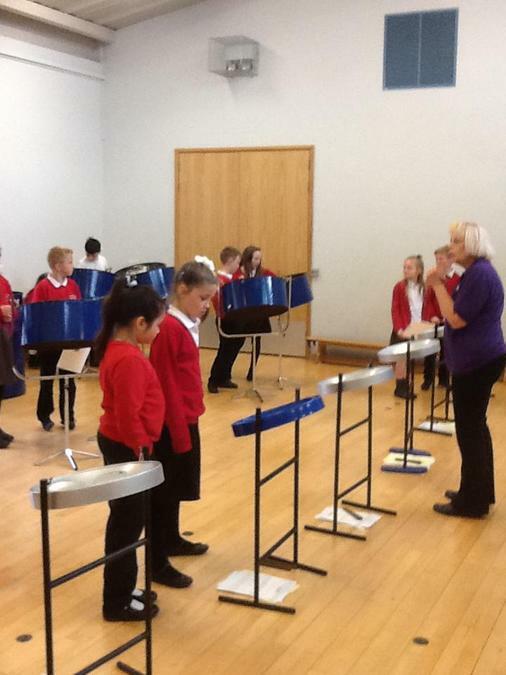 On Friday, Miss Clough brought in the steel pan drums. Photos to follow.